This collection of March bell ringers has been created to help you create a simple and engaging morning routine. 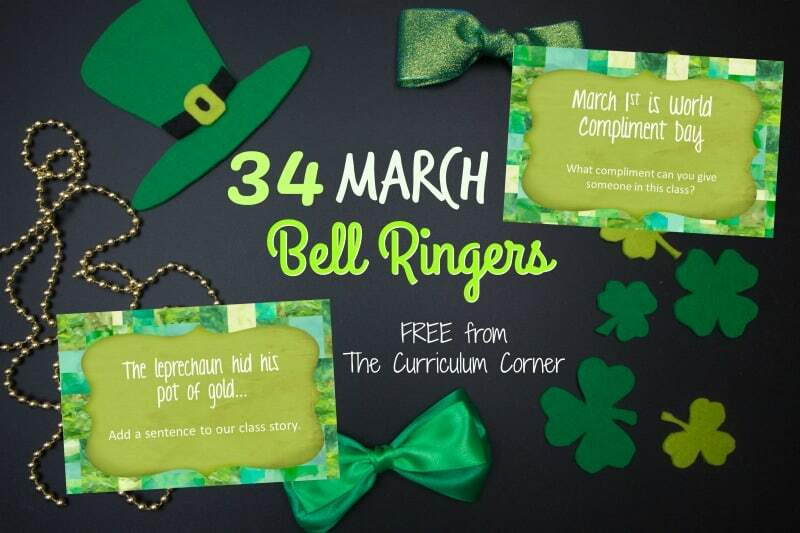 You can download this free set of March bell ringers by clicking on the bold Bell Ringers for March link at the bottom of this post. This set contains another free resource for teachers created by The Curriculum Corner. 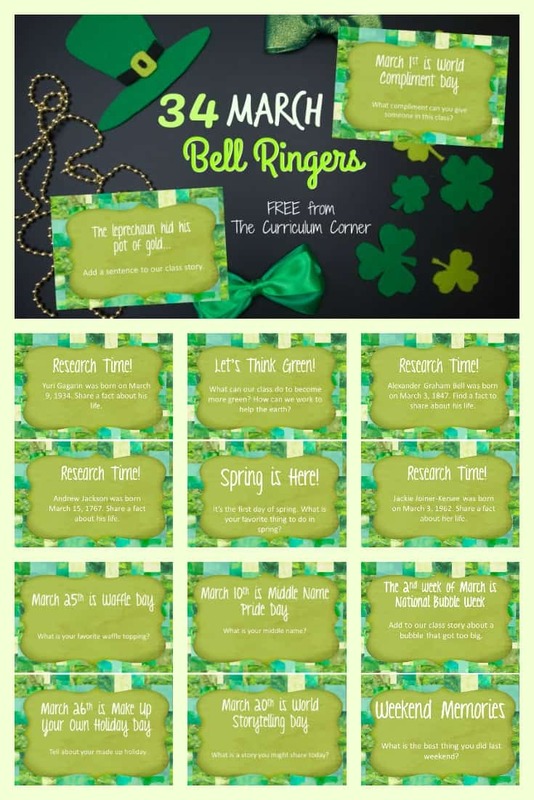 To use these March bell ringers, print in color and laminate. Once you have cut apart the prompts, you will have a set of 34 prompts to use for March. We have included a wide variety of prompts. Because there are 34 cards total, you will be able to choose what fits your school and class. You will be able to use a bell ringer each day that will fit your class. Along with the cards, we have provided a list of the bell ringers at the end of the download. To use, dedicate a spot in your room for your daily prompt. If you have a white board, place a supply of dry erase markers at the board for student use. For teachers who do not have a large dry erase board or chalkboard, you can post on your wall and provide students with post-it notes to use for responses. If you have other creative ideas for your bell ringer responses, please share below! Help students learn that their task each morning is to come in and respond to the daily bell ringer. Some days you might highlight a few responses by talking about answers during your morning meeting. Be sure to add your response each day! Students will love seeing your thoughts as well. For the prompts that encourage your class to write a story, you might choose to allow students to turn this response into a writing piece. A student could take the writing piece and lined paper to copy down the story. Once the story is recorded, the student can illustrate what was written. Encourage students to expand on what the class created. Another idea for using in your classroom is to place a card or multiple cards at a writing center. They can be used as writing prompts for students who are “stuck” and need a little help getting started with their writing. Be sure to bookmark this page so you can easily find it each year. Not sure how to bookmark? Check out this tutorial we created: Bookmarking in Chrome. I love the bell ringers. Will you be making a 1-2-3 version? Thanks so much for sharing!